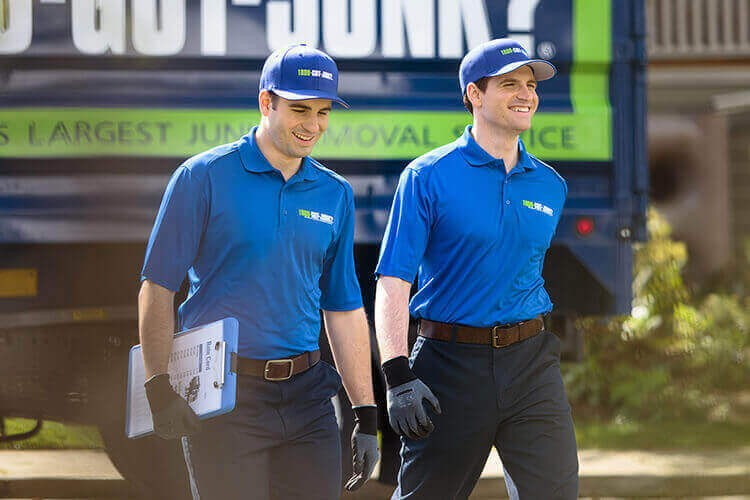 Refrigerator Removal & Recycling | 1800-GOT-JUNK? If you’ve ever tried to move a fridge on your own, you know it’s not a one person job. They’re incredibly heavy, awkward to maneuver, and take a small team of people to move. Not to mention the fact that they can’t just simply be thrown out. Even if you manage to get it to the curb, many areas don’t offer fridge pick up as part of their rubbish disposal services. 1. Simply schedule your fridge removal appointment online or by calling 1800-468-586. 4. Once you say the word, we’ll remove your fridge from wherever it’s located and finish by cleaning up the area. We recycle and donate your refrigerator whenever possible. Instead of attempting to get rid of your old fridge on your own, let 1-800-GOT-JUNK? handle it. We're happy to help, whether you have a single home-sized refrigerator or a few dozen chest freezers ready for removal. (In fact, our trucks can fit up to eight, full-sized, stand-up refrigerators!) We’ll do all the heavy lifting for you and we’ll make sure it gets donated, recycled, or disposed of properly. When you call 1-800-GOT-JUNK? to handle your fridge removal, you can feel good about helping the environment while also saving yourself the time and effort required when you handle it on your own. You sure can! Most fridges and freezers can be recycled. The process is a bit complex though, so it’s important that it is handled in the proper way. Most refrigerators and freezers contain oils and chemical refrigerants that need to be carefully removed and properly disposed of according to federal law. Once this process is complete the fridge can be broken down into parts for recycling. Making sure your fridge is properly disposed of is a bit of a process that requires much more effort than simply leaving it on the curb with the rest of your household rubbish. Taking steps to properly dispose of your old fridge is important because it contains harmful chemicals that can damage the environment. With fridge recycling, these harmful chemicals get properly disposed of and any reusable materials such as the metal, plastic, and glass also get recycled.